Winter has finally arrived. The dark and cold make the temptation to stay under the covers until breakfast time far too easy. Jess Thorpe shares her 5 top tips to get out the door and keep to your training plan this winter. Put your phone (or alarm clock) on the other side of the room. Once your alarm goes off it means you physically have to get out of bed to turn off the alarm, decreasing the chance of pressing the snooze button. This is the hardest part of the morning. Turning lights on quickly will also wake the body up quickly and deter you from jumping back under the covers. Prepare your kit bag and clothes the night before. Having your swim bag packed, bottles prepared and clothes ready to jump into make it easy to get ready and leave the house quickly. This also maximises your time in bed! If you’re going straight to the office from the pool or gym prepping your meals the night before also saves time and hassle in the morning. Arrange to train with a club, friend or personal trainer. Having the obligation to turn up and meet a friend, your swim club or a trainer to workout with is a great motivator to get out of bed. If you stay in bed, you let down your friend, if you miss your PT session you’re still going to be charged, and if you miss the club session you’ll likely get some backchat when you next turn up! It also makes training more social, and you can always grab a coffee afterwards if you have time! Think of your goals. Winter is long, and depending on your sport you might not do an A race for many months to come so think of your main goals for the 2019 season and make them a driver to jump out of bed and train to win a particular race, perfect your stroke or hit a PB next year. If you’re super competitive you can always think about the people you’d like to beat next season too. Reward yourself. This doesn’t mean you should buy a chocolate bar every time you train but if you’re getting up early 5 days a week you can certainly treat yourself to a coffee or hot chocolate later in the day, or a glass of wine at the weekend, or a new pair of goggles to match your swimsuit collection! 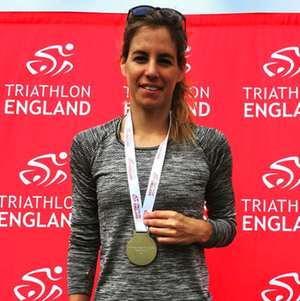 Jess Thorpe is European Aquathlon Champion 2016, 2017 and 2018 National Aquathlon Champion and 2018 European Silver medalist.